All natural fertilizer. All natural source of organic Nitrogen and Phosphorus. 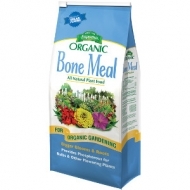 Domestic Bone Meal is 100% pure, with no additives or fillers. For bulbs and all perennials at planting time.